James Muirhead was a guild member from 1817 to 1841. He was appointed watchmaker to Queen Victoria, and produced high-quality long-case clocks in Glasgow, Scotland. For a time he partnered with a Mr. Arthur - guild records reflect the partnership of Muirhead and Arthur only in 1840. I had gone through this mechanism perhaps 10 years ago - and remembered that it stood out for the quality of the pivots, pinions and gear work. It was a real pleasure to go through it again now that it is going to a new home. After working on perhaps 300 or 400 Viennese mechanisms the simplicity of a British piece is a real shock. But, unlike most of the British mechanisms, this one, due to Muirheads attention to detail, stands out for its quality. I couldn't believe how easily I was able to bring the pivots to a perfect burnished finish! 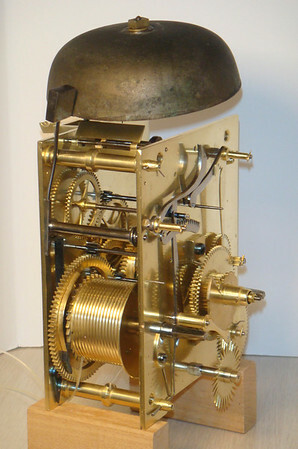 Enjoy the pictures - this is a wonderful example of a mid-1800s British mechanism.